A humorous and philosophical trip through life, from the New York Times–bestselling coauthor of Plato and a Platypus Walk into a Bar . . . 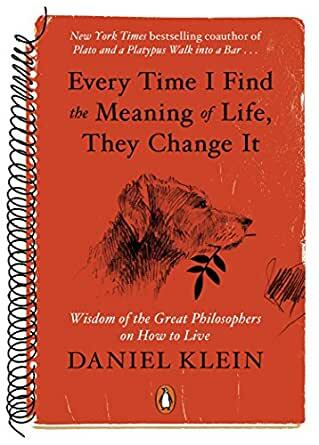 This is my third Daniel Klein book and probably the meatiest in terms of discussion.of philosophy and its application to a meaningful life. Kudos to a gentlemen who is at or near the 80 year point and still writing witty, thoughtful and original material. I only took one Philosophy course in college rather than majoring in it as Klein did. It was difficult and delightful. I would say the same about Klein's books-deceptively short and humorous, but worthy of reflection. Food for thought and ammunition for multiple interesting conversations. Deep, funny and insightful. You will end up reading this book over and over again. It is the kind of book that will get smudged at the edges by thumbing through over the years. Chapters are small enough to read and deep enough to keep you pondering for hours. First book I have ever read by Klein and I thoroughly enjoyed it. We all have our own meaning in life and I was looking for something to help me understand why some of my values and what I thought my understanding of my definition of the meaning of life was shifting. Klein provides some great insights that I found personally insightful and useful. It's an good book. There are a lot of truths in the book and humor, which makes the book quite enjoyable. It’s a short read. However, at the end of the day, none of the philosophies stick for me. The whole book just feels a bit random. 5.0 颗星，最多 5 颗星Great perspective. Daniel Klein is such a gifted writer. Putting philosophy into context for everyone. Great perspective.